© 2012 by Nicola Winters all rights reserved; content may not be copied, rewritten, or republished without written permission. This article was last revised on 08/23/17. Window treatments within the home can be an effective and inexpensive way to transform a room or area as well as providing privacy. A common misconception of shutters is to imagine those ugly, bulky metal sheets that hang down from shop windows at night; a playground for graffiti artists and vandals alike. However, interior window shutters fitted into peoples homes are of a completely different nature. Not only are they visually appealing and can create the perfect finish to any newly decorated room, but they can also increase the level of security and privacy experienced within the house. Interior wooden shutters are available in a wide range of colors, styles, and sizes, meaning most interior designs can remain consistent throughout. However, for those who are still struggling to find a suitable design or color to suit their needs, why not custom make your own? 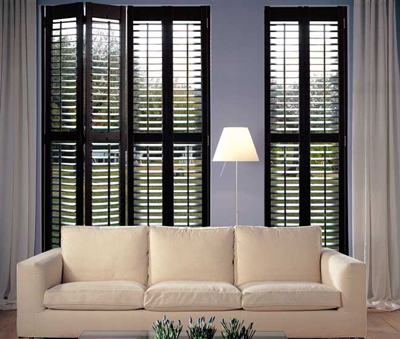 Many manufacturers and retailers will be happy to provide shutters tailored to the individuals needs. The problem with window treatments, along with most furniture, is that it will need replacing or sprucing up every now and again. This can be an expensive and inconvenient process but sometimes subtle changes can create a whole new look. For example, a lick of paint or new handles or knobs will provide the homeowner with an instant transformation for their windows, eliminating the need for brand new shutters. There are several techniques that can be used to spruce up your window accessories. Depending on your reasons for painting, and the condition of the wood, this can be a great way of removing the need to purchase new shutters. If your home is currently being decorated in a different color or style, it may be necessary to apply a solid coat of paint to them. Dont worry if the shutters have been painted before, just use light grained sandpaper to remove the previous coat of paint then wash with warm soapy water. If you happen to get down to bare wood at any point, be sure to apply primer before painting. Keep in mind that oil-based paint should be covered with oil-based. Latex-based paint should be covered with latex-based. This method is ideal for shutters that are experiencing wear and tear and are in need of a face lift. However, if the wood is in good condition then polyurethane or a clear or translucent paint may be more suitable. This will add a flair of authenticity to your room or home as the natural wood grain and variation will be visible to see. Whether it is a change in handles, knobs, or hinges, a shutters appeal will certainly be increased by attaching new accessories. A clean, polished and sophisticated look can be achieved. Take note of other subtle touches around the home before making a decision regarding which addition is best for you. For example, if door handles, light switches, and plug sockets are all chrome, chrome shutter handles will achieve a level of consistency throughout the house. Not only are interior wooden shutters a great addition to any home but they also have the potential to last well beyond that of other standard window treatments. However, if you already have shutters fitted, by following the tips above you are sure to fall in love with them all over again. Do you have any interior wooden shutter upgrade tips for our readers? Scroll down to the comments section below and share.